When the number of runners fell to just six, the higher ups at Elysium decided to announce that eh Race was entering its last part. They could show the path that would lead us to the goal post as all that was left of the Race had been secured with the most advanced technology. The winner would get the Grand Prize, but the other "survivors" wouldn't go empty handed if they managed to complete the Race. As for the rest, who couldn't leave the building until the end, were told to place bets to make it more interesting. How did it affect the Race? It became weirder. 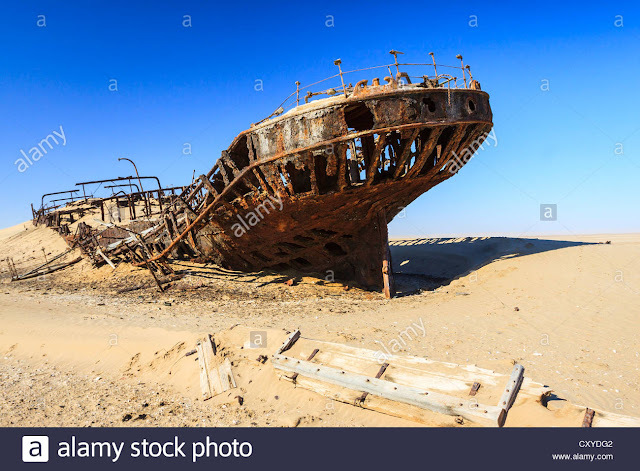 A lot weirder, and we are talking about a seemingly endless desert were you can come across decaying ships like the one on top of this entry. There were six vehicles left in the Race: one tank, one truck, two cars and two bikes. There were also the support vehicles, one for every participant. When they entered the last stretch, we found out what Elysium meant by secured. It was like entering another dimension. Elysium had turned miles of Namib desert into something that looked and felt like their virtual worlds. Their robots and traps were just not something added but built into the world. As you can guess, that made the Race more dangerous. One car was eaten by a massive bright orange worm that made sounds like a whale. One bike fell down on a hole and the hole closed up. All that happened in less than five miles. Tension was sky high both in the Race and in the building. The Race had entered uncharted territory. It was not our physical world, it wasn't the kind cyberverse we usually travel to, it was a crazy mixture of both, where the most basic rules of physics seemed be on constant flux. Gravity was fluid, heavier in some areas and lighter in others. Thankfully it never ceased to exist as that would have sent everyone left in the Race into the space at a ridiculous speed. One tank, one truck, one car and one bike, the one driven by our fabulous Zirconia Starfighter miraculously survived all the traps and obstacles introduced by Elysium. The goal post was finally there, an Emerald tower, so unreal that felt like an illusion. Suddenly there were no more traps and the robots just looked at the runners. We didn't want to be the focus of Elysium's attention, so Zirconia Starfighter ended last, a fourth position that would grant her and us access to the information we were looking for. Only four runners ended the Race through the Namib desert and whatever the last part was. Four drivers that had become legends, if they hadn't earned that category before. Now all there was left was to collect the prizes.